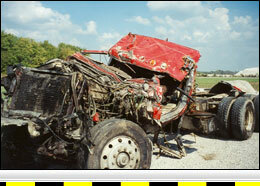 Crash Forensics provides forensic Crash Reconstruction services for large truck crashes. 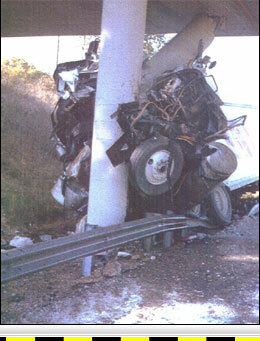 Unique aspects of large trucks require that special considerations be made when assessing these crashes. These factors are explained below. Link to our reconstruction experts. The most dramatic difference between trucks and cars is that trucks take much longer to stop. When reconstructing a car crash, the main factor to consider when calculating speed from skid marks is the type of surface the vehicle is skidding on. This factor is very important in reconstructing truck crashes as well. However, there are many other factors that must also be considered. First, trucks with properly maintained brakes generally take 25 to 65 percent longer to stop than a car or, stated differently, they have a 60 to 80 percent braking efficiency. The greater efficiency would be for a fully-loaded truck and the lesser efficiency would be for an unloaded truck. These increases in stopping distance are partially attributed to the tires used on trucks. Truck tires are made from very hard rubber, so they will last much longer than car tires. However, this feature causes them to generate lower friction values than the softer-compound car tires. Since trucks take longer to stop, a reconstructionist must include adjustments to the normal friction values used in his calculations. If speed calculations do not include these adjustments, then the calculated speed of the truck will be too high. If surface friction values are obtained by skid testing a passenger vehicle, then adjustments to these friction values must be made. If the truck's brakes are properly maintained, then the friction value should be multiplied by about 60 to 80 percent. For example if the friction value for a particular surface is determined to be 0.60 then this number would be multiplied by 60% to 80% and the result (0.36 to 0.48) would be used to calculate the truck's speed from skid marks left on that surface. 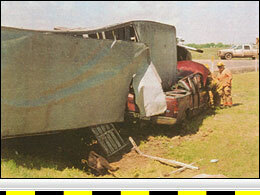 Brake factors must also be considered when reconstructing a truck crash. The two most important factors are brake balance and brake lag time. Brake balance is created by having matched mechanical components that are working properly, adjusted correctly, and have equal air pressure at all brakes. Brake balance is also affected by the distribution of weight on the truck. Brake imbalances cause many stability problems and can lead to brake fade and brake fires. However, this discussion is limited to exploring the relationship of brake balance to stopping distance as used in crash reconstruction. Under emergency braking operations, brake imbalances cause some brakes to fully lock while others do not. 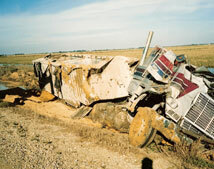 It is uncommon to find 18 skid marks from an 18-wheeled truck at a crash scene. This brake imbalance creates some disparity in a crash reconstruction since a truck skidding on all its tires will stop in a shorter distance than one that is not skidding on all its tires. When a skidding truck is found to have only locked some of its tires, then additional adjustments to the friction value or rate of deceleration will have to be made. Without these adjustments, the calculated truck speed will again be too high. This circumstance, where not all wheels are locked, can be dealt with by using alternative assumptions that the brakes that did not lock were either fully braking or not braking at all. These assumptions can be used to create a high/low range of speed for the truck. One of these assumptions can also be used to produce a conservative speed estimate. Depending on the situation and position of the expert, this conservative estimation may be acceptable. The low-speed scenario assumes that the brakes that have not locked are generating no braking force. However, these brakes most likely are generating some force. On the other hand, the high-speed scenario assumes that the brakes that have not locked are generating full braking force when they most likely are not. Therefore, either one of these scenarios could produce unrealistic numbers, but the two at least give outside bounds to the solution. A couple of tests can be performed to determine how much braking force unlocked brakes are capable of generating. If the truck did not receive disabling damage from the collision, its braking capabilities can be determined by skid testing the truck. Skid testing would allow us to determine exactly what the deceleration capabilities of the truck are. 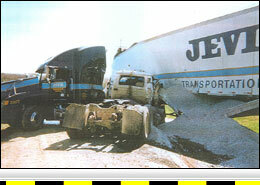 Performing this skid testing at the crash site is ideal, however, most often that is impractical. Therefore, an alternative location is usually used to test the truck. When an alternative location is used, a standardized method of testing both the friction of the crash site surface and the test surface must be used. This will allow the two surfaces to be compared and adjustments to be made to compensate for differences between the test surface and the crash site surface. An alternative method to determine how much braking force is available on a truck is to use a brake dynamometer to test the force output of the brakes. A brake dynamometer is a device that most typically uses rollers to spin the wheels of a truck. As the wheels are spun by the rollers, the brakes are applied and sensors on the rollers measure brake force. This is probably the best method to test brake force, however, collision damage may limits its use. Another way to determine how much braking force is available is through brake force calculations. These calculations can be performed using information gathered about the brake system during an inspection. Dimensions such as brake drum diameter, brake chamber size, slack adjuster length etc. are measured during an inspection of the truck. This information can then be put into an equation to calculate brake forces for the brakes that did not lock. 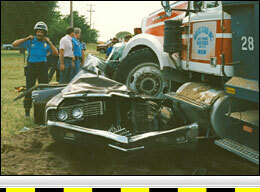 Another brake factor to consider when reconstructing a truck crash is brake lag time. The two kinds of brake lag are mechanical lag and air-pressure lag. All brake systems have mechanical lag or a slight delay in the buildup of brake force after the brake pedal is applied. Air brakes, however, have an additional delay, related to the build-up of air pressure. This delay is the time that it takes for air to travel from the air tanks to the brake chambers and to build to a pressure that will generate brake force. A reconstructionist is mainly interested in the lag time from brake application to wheel lockup. Most commonly, a time of about one-half second is used by most crash reconstructionists. This time is usually added to the driver's perception-reaction time when a time-distance analysis is performed. This time is taken from requirements that mandate that brake-systems achieve 60 psi in less than approximately ½ second (or .35 to .60 seconds depending on the type of vehicle). To use this lag time in a reconstruction, the following assumptions are made: (1) the brake system will take all of the required maximum allowable time to reach 60 psi; (2) the brakes will not lock until they reach 60 psi; and (3) no braking force occurs until the brakes are locked. In reality, most trucks will deliver 60 psi to the brakes in less than one-half second. Additionally, the brakes can lock at pressures lower than 60 psi. Obviously, lower pressures can be achieved faster. For example, an unloaded truck can lock its wheels at 30 to 50 psi and have a shorter lag time. Also, a common assumption is that during lag time the truck is coasting with no deceleration occurring. In reality, the brakes are slowing the vehicle, however, the wheels have not slowed to the point in which they will begin leaving marks. In practice it is very difficult to correctly account for the affects of brake lag without some assumption. When these assumptions are made, an expert must be conservative to his client's position. A common method for reconstructing crashs is the Conservation of Linear Momentum. But this method has limitations for car/truck crashs. As previously discussed, this method takes into account the weights of the vehicles, the angles at which they collided, the effective coefficients of friction, and the places where they come to rest. Linear Momentum is very reliable when it is applied to a collision involving two cars that have relatively the same weight. 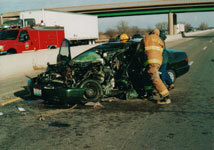 However, when this method is applied to a crash involving a car and a truck, reliability problems can arise. With a large difference in the weights of these vehicles, this method is very sensitive to very small changes in both the impact angles and the post-collision angles. The car is relatively light and, therefore, must have a lot of speed to change the direction of the truck. Changes to the collision angle are essentially saying that the car affected the direction of the truck more or less. In a car v. car crash, slight errors in measuring or estimating the collision angle will ultimately have little affect on the calculated speeds. However, in a car v. truck crash, slight differences in the collision angle, although they have very little effect on the calculated speed of the truck, can have a very large effect on the calculated speed of the car. 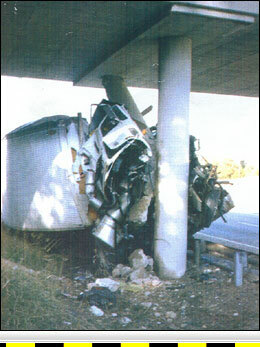 It must be understood that truck crashes are much more complicated than car crashes. Therefore, the reconstruction of truck crashes requires a highly-skilled reconstructionist with a firm understanding of these differences. Additionally, the reconstructionist must have a very good understanding of how air brakes work and how to deal with air brake factors in the reconstruction.